The Long And Short Of It are an ARIA charting, multi-award-winning duo from Melbourne, whose superb harmonies have been described as “Honey coated chocolate”. However, it is their outstanding live shows that draw support from fans and critics alike. They are true masters of their craft. They have written and recorded songs in Nashville. 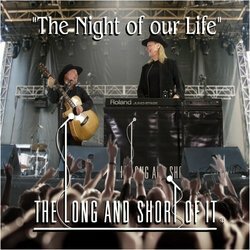 The album “Night of our Life” was released in October and jumped into the ARIA Hot Hits chart at #3 and remained in the ARIA country music Top 20 for 20 weeks. Old School is the latest single release. Other singles released from this album have had major charting success with the last two releases, “Kangaroo Rodeo” & “Gypsy Whitemoon” hitting #1 smash hit position in the Country Tracks Charts for several weeks. The Long And Short Of It are an ARIA charting, multi-award-winning duo from Melbourne. 'Old School' is their latest single release from their ARIA charting album, 'The Night Of Our Life'. It is the first duet released by Patsy & Dave and is a light-hearted song about how old-fashioned manners can win over a love interest.